I’m just back from holiday in central Australia, near Alice Springs. There’s ferns even in the desert. Strictly speaking, it’s apparently an “arid” region, rather than desert. In any case, it was dry. But there were still ferns. We noticed six species. Resurrection ferns. So named because they curl up when it is dry and look dead, but spring back to life when it rains. We spotted two kinds: very hairy (Cheilanthes lasiophylla?) and not hairy (Cheilanthes sieberi?). 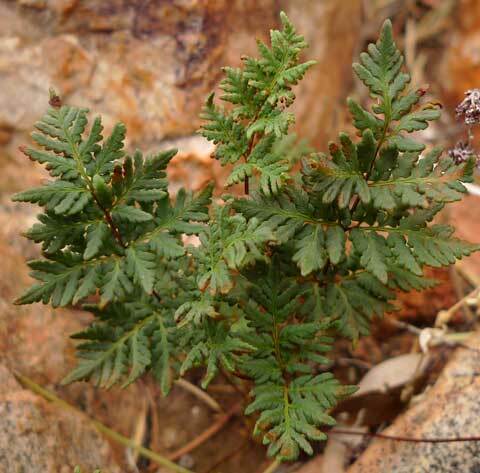 Cheilanthes lasiophylla. From left: dry and curled; resurrected, upperside; underside. Photos by Leon Perrie. (c) Leon Perrie, Wellington. 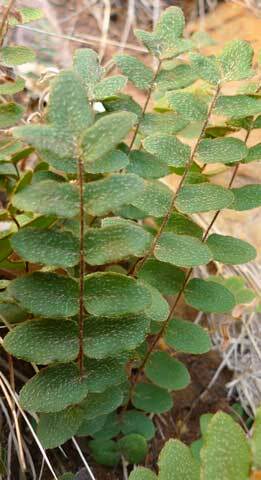 Cheilanthes sieberi. Photo by Leon Perrie. (c) Leon Perrie, Wellington. The above two were actually quite common, poking out from crevices, and even abundant on the ground in places. The others were much less frequent. Hairy ferns. Hairs are a common adaptation in the desert. They reduce evaporation. Pleurosorus rutifolius (Blanket (!) 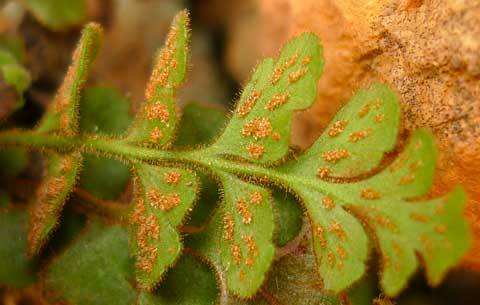 fern) is related to Asplenium (the spleenwort ferns, including the hen & chickens fern). Photo by Leon Perrie. (c) Leon Perrie, Wellington. Paraceterach reynoldsii is a hairy version of Pellaea (button ferns). Photo by Leon Perrie. (c) Leon Perrie, Wellington. 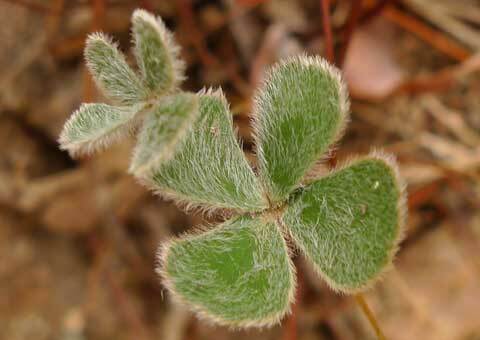 Marsilea ferns look like four-leaved clovers, and are principally aquatic. This one was in a watercourse that had dried up. Photo by Leon Perrie. (c) Leon Perrie, Wellington. The oddity. Waterholes persist in some of the sheltered ‘gaps’ (river-cut passes through the ranges), even in the driest periods. 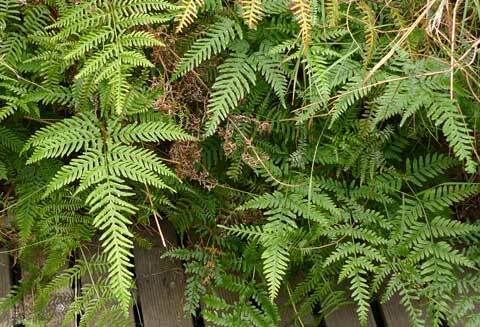 These provide a home for more water-needing plants, including the shaking brake, Pteris tremula. Shaking Brake fern, Pteris tremula. Photo by Leon Perrie. (c) Leon Perrie, Wellington. 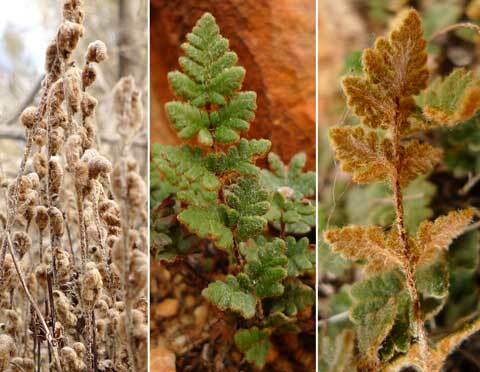 It may be no surprise that Pteris tremula also occurs in New Zealand. 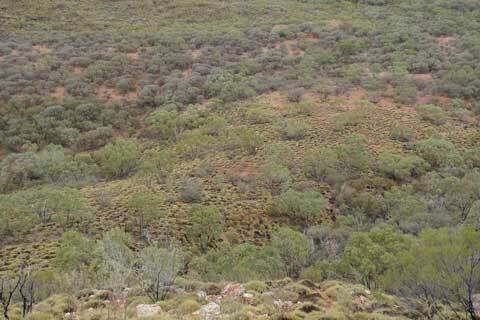 But so do Cheilanthes sieberi and Pleurosorus rutifolius, albeit in dry habitats. Central Australia – it’s big and it’s dry. We had a couple of weeks on the Larapinta Trail, and another week driving around the nearby attractions. It’s not devoid of vegetation by any means, but the plants certainly don’t form a closed cover over the ground. More treeland (or ‘savannah’) than forest. 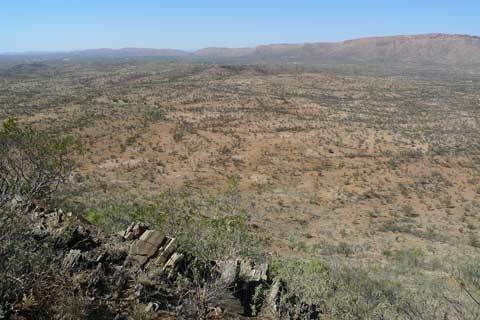 Typical vegetation along the Larapinta Trail. Most of the green trees are gums. The grey trees towards the back are wattles. The low-growing clumps are ‘spinifex’ grasses. Photo by Leon Perrie. (c) Leon Perrie, Wellington. Looking towards Alice Springs from Euro Ridge. The dark colours are plants, comprising a woodland over the red earth. Photo by Leon Perrie. (c) Leon Perrie, Wellington. Compared to our previous experiences on the Bibbulmun Track in south-western Australia, gums (albeit of shorter stature) and wattles are similarly common, but cassias (Senna) had largely replaced the true peas, the Proteaceae were much less diverse and interesting (just Hakea and Grevillea, but no Banksia, Dryandra etc. ), and we didn’t see a single orchid.